This week, for once, Penzance cannot have the charge of dullness laid at its door. 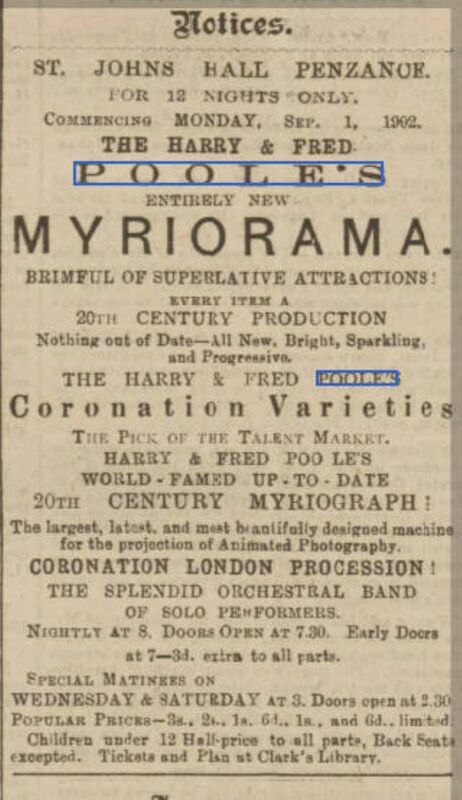 The excitement is mounting, because Harry and Fred Poole have brought their Myriorama to town. And they bring with them the craze of the new century – moving pictures, courtesy of the “MYRIOGRAPH”. The device is indeed, as they say, the “Largest, latest and most beautifully designed machine for the projection of Animated Photography”. Here we have “enterprise, and thoughtfulness”, a show “up-to-date in every respect”. No expense is spared in securing the best views, for transfer – by means of 20th century wizadry – to the screen. Thus the Pooles educate and amuse us, and always have plenty of customers. There is spectacle, provided by the photographs specially taken back in August for His Majesty’s Coronation. The Cornish Telegraph, in a piece which I must say is a little brief, will pick that out for special mention in tomorrow’s edition. But more will come to St John’s Hall for the thrills, to watch scenes from afar, but with local import. Here is the Roddam, as described by the Cornishman journalist who visited yesterday: “her decks covered with blazing matter, and as she slowly leaves the scene of death and desolation many are reminded of the heroic conduct of officers and crew, the former including the brave Marcom Lawry, of Penzance”. And here is our Navy pitched against submarines, with the “battleships and cruisers ….seen at anchor, even as they were at Penzance, not many weeks ago”. We may thrill to the threat posed by the “submarine engine of war” which – we see – “has descended into the depths of the blue ocean…. proceeds in the direction of the unconscious battleship of the enemy, and discharges a deadly torpedo, which works destruction and death”. But the show is not limited to the Myriograph, and the twentieth-century shades and terrors it conjures before us. No, Messrs Poole have many strings to their bow. It is no idle boast that their show is “BRIMFUL OF SUPERLATIVE ATTRACTIONS”. 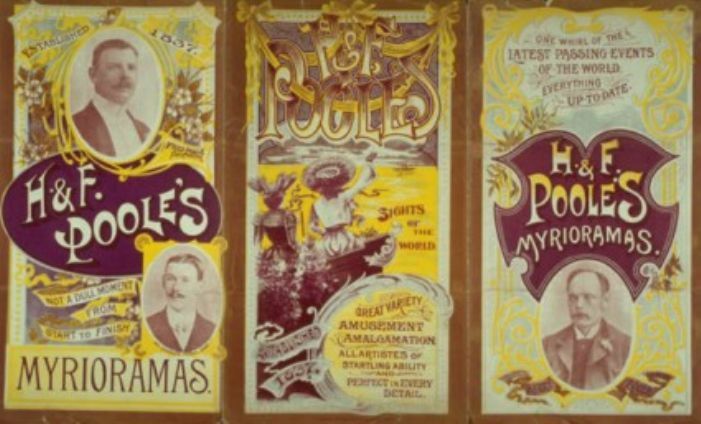 Let us consider the “Coronation Varieties, THE PICK OF THE TALENT MARKET”. Here are performing dogs, including “giant boarhounds”, displaying their “wonderful sagacity”. Here are marionettes, and a shadowgraph. Here is skating, and bicycle acrobatics. Here is dancing, French style, from La Belle Papillon (or, as we would put it, “Beautiful Butterfly”). And here is Mr Philip Percival in fine baritone voice. The band is described –with justice, I’m sure - as “SPLENDID”. And there is more; so much more. But perhaps best of all, Messrs Poole are bang up to the minute. “EVERY ITEM A 20TH CENTURY PRODUCTION” as they say. “Nothing out of Date – All New, Bright, Sparkling and Progressive”. The show opened yesterday, and simply everyone is going. The Myriograph will be cranked up to perform nightly at 8.00. Tomorrow – Wednesday - there’s an afternoon show, and another on Thursday – just so that the folk who come in for the market can attend. Messrs Poole, in their generosity, have engaged to spend 12 days in the town, so plenty of chance for all to see the show – yes, and holidaymakers too. Perhaps more than once, should the weather turn autumnal. Buy your tickets now at Clarke’s Library! Roll up, roll up!